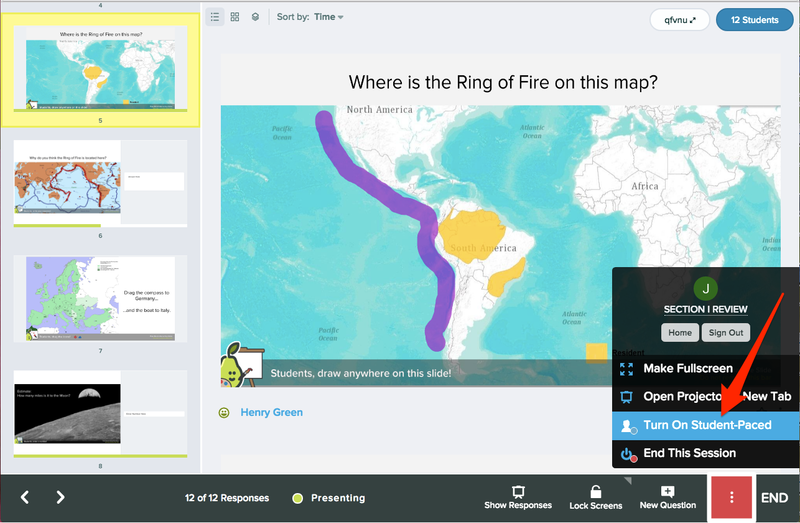 Pear Deck is often used to engage students in a lesson in real time. But you can also give a Pear Deck lesson to a student who missed class, flip your lesson, differentiate or scaffold instruction during class, and more! In the middle of a presentation, flip on Student-Paced mode from the More Actions (three-dot) Menu. Hover over the Navigation bar. Click on the More Actions button. Leave the Session. You don't need to keep your tab open if you don't want to. Simply close your session browser tab. You will leave the Session without turning off Student-Paced. Stop Student-Paced Mode. Let's say you want to draw students' attention to the front of the room and sync everyone up to your screen. Just go to the Navigation bar and click Stop Student-Paced. This stops Student-Paced mode, but leaves the Session active and gives you control of the slides again. End the Session. To stop access to the Session completely, you can (1) open the More Actions menu and click End This Session, or (2) simply click END. You can also turn Student-Paced mode on or off from any Sessions Menu. Go to your Pear Deck Home Sessions page. Or, go to Pear Deck Home > Present a file from Drive and click on a recent file to open the file modal menu. Find the Session and make sure it is live. If it is not, click on the More Actions (three-dot) button and click Reopen Session. The Session must be live for Student-Paced mode to work. Now students can join the Session and work through the slides anywhere. You can even close your browser or turn off your device. To verify that the the Session is in Student-Paced mode, just go to your Sessions menu. To join any Pear Deck Session, students will need a stable internet connection, a Google account, and the link or the Join Code from your Session. Students will go to joinpd.com to sign in. When you're done, click on the More Actions button and Turn Off Student-Paced. Or, click End Session to close the Session and end students' access to it entirely. When you turn on Student-Paced Mode, your students can suddenly flit through slides. This can make it hard to know where each student is or if they might be stuck. So we built some special tools into the Teacher Dashboard (a Premium feature) to help you keep track of what each student is doing. At the bottom of each slide thumbnail, you can see a little green progress bar to show you roughly what percentage of the class is done with that slide. In the example below, I can see that most of my class is done with the top slide. These blue person icons will appear to tell you the exact number of students on each slide. I saw that some students are falling behind the rest of the class. I clicked on the blue person icon to see their names so I could check in on them. What is the difference between the normal presentation mode and Student-paced mode? Each time you start presenting a Pear Deck, you start a new Session for your students to join. By default, you have control over the slides on both the Projector and Student Views (the sync up). To let students move through the lesson at their own pace, turn on Student-Paced mode. This gives students navigation controls on the Student View and lets them move through all of your slides at their own pace. Can any kind of Session be set to Student-Paced mode? 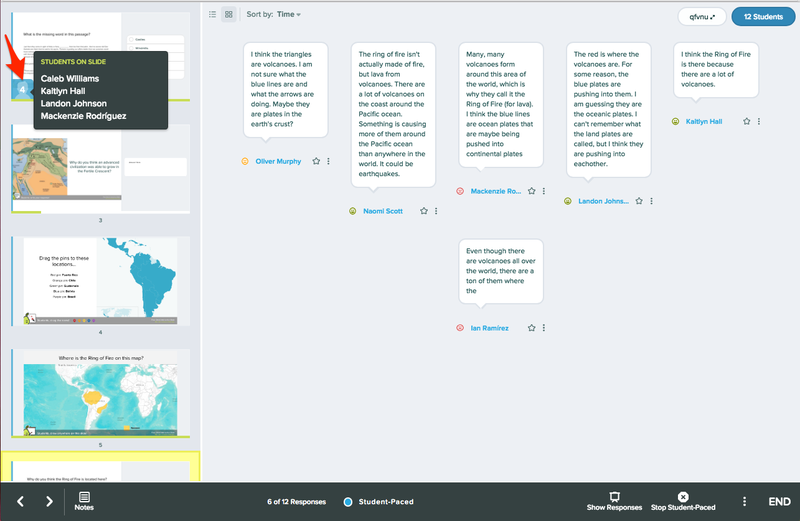 Yes, you can turn any Pear Deck Session into a Student-Paced Session. Can students use this at home? Yes, and it's perfect for flipping the class, assigning homework, and letting a student who missed class catch up with a lesson! Just start your Session, turn on Student-Paced, and make sure students have the Session Join Code. They will be able to log in at joinpd.com with their Google account and the Join Code. Is it okay to turn Student-Paced on/ off in the middle of a lesson? Yes. You can toggle Student-Paced mode on or off at any time , whether students are currently logged in or not. No data will be lost! If students are moving at their own pace and you turn Student-Paced Mode off, their screens will sync back to whatever slide you're looking at on the Projector View. If you turn it back on, each student will be returned to the slide they were on previously. Do students' responses show up on the Projector during Student-Paced mode? No, responses will not be displayed on the Projector View during Student-Paced mode. 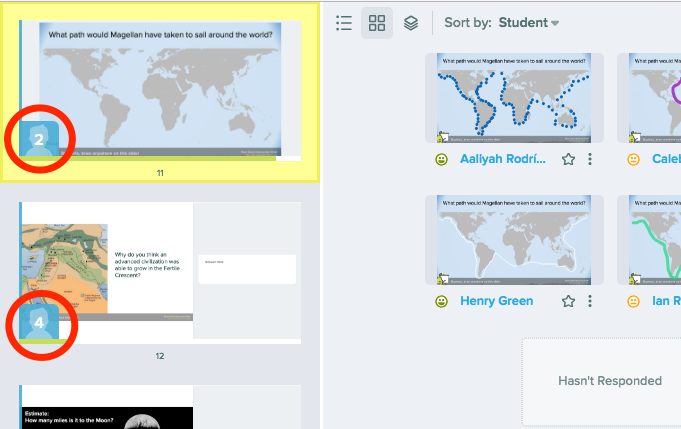 However, all responses are automatically saved in Pear Deck. 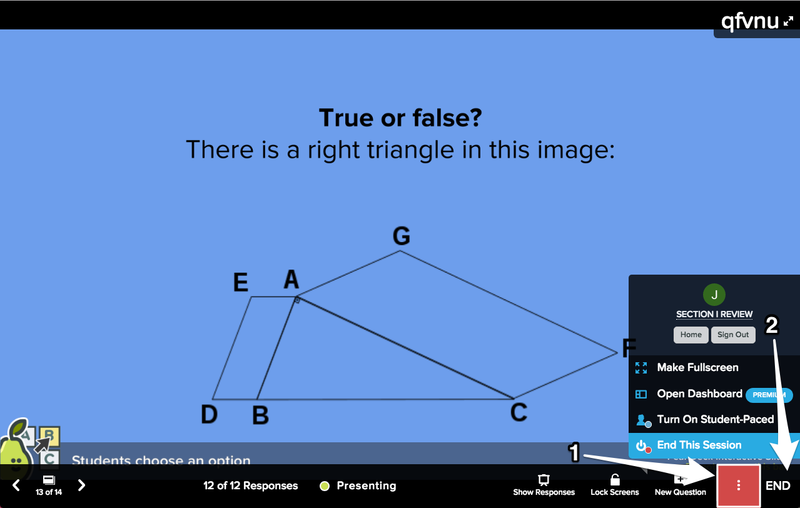 To show the answers to the class later, simply turn off Student-Paced mode, go back to the slide, and show the responses on the Projector View. Can I see what my students are doing? Yes you can, with the private Teacher Dashboard, a Premium feature. Check out the See what Students are Doing section, above! Will this still work if I close my browser or turn off my device? Yes, you can close your browser or turn off your device and it will still work. You choose when to end Student-Paced mode. To manage the Session status, go to your Sessions menu.